I see these mistakes being made with nearly every new wellness virtual business I see. Here are the 3 common mistakes and what to do to start being profitable. Creating a virtual business is easy. Don’t believe me? Here’s how it goes: you buy a domain, pick a website template, add your services to a page, and boom. A virtual business is born. But to create a profitable virtual wellness business… that takes something much more. It’s not necessarily difficult, but it requires intention in your thoughts, your plans, and your execution. When I first created Grass Fed Salsa (my virtual wellness business) in 2014, I completely lacked intention. I gathered free information from all the corners of the internet and implemented all the suggestions. I followed every bit of technical advice I could get: I created an online course, a free ebook, a paid ebook, a group coaching program, a free email series, a one-on-one coaching service, I guest-posted consistently on sites with larger followings, I Periscope’d, I Instagram’ed, I Facebook’ed. I did it all. In hindsight, I was making 3 big mistakes with my virtual business. Looking back on those first years, I can clearly see the mistakes I made. These are especially clear to me now that my business is profitable, and unfortunately, I see them happening with nearly every new wellness business I see. 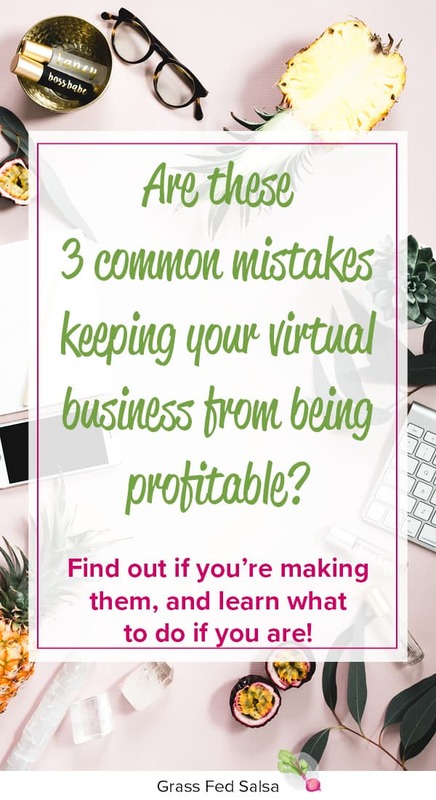 Today I’m sharing the 3 common mistakes I made when building my virtual business, and what I changed to finally start making a profit. Mistake #1: Neglecting to pursue your true passion. In 2014, I blogged about the keto diet. I even created an ebook and group coaching program called the Body By Butter Protocol. About 8 months after I started my keto diet blog, I changed my focus because I thought it’d be too hard to gain traction talking about how people should eat more fat. Ironic since these days, the keto diet is insanely popular with 1-10 million google searches each month. But instead of pursuing the keto diet niche (which at the time not many people were talking about), I switched my focus to the Autoimmune Protocol. I even went so far as to delete almost all of my pre-AIP, keto diet blog posts. Now don’t get me wrong, I’m so happy to create content for the AIP community! However‍, I do regret why I chose to make that transition. I started my journey on the Autoimmune Protocol in October of 2014, just about 8 months after starting my blog and wellness business. I followed AIP with a low carb/high fat + intermittent fasting approach from October 2014-April 2015. Despite having tremendous healing success on it, I never felt comfortable sharing that my AIP was fat-focused. Instead, I hid all aspects of this fat focused AIP diet because one of the top names in the AIP niche did not condone a ketogenic approach, especially for those with autoimmune disease. So instead, I followed the crowd, sharing my AIP content in the same way everyone else did. Not only did this mean my content wasn’t standing out, but it was also hard to stay motivated in creating new content, since what I believed I needed to share wasn’t what I felt called to share. Lesson Learned: Content creation is difficult if you’re trying to fit into a mold that isn’t right for you! Action Step: Find what you’re truly passionate about and create content in your own unique way. This will help you to find your tribe, stand out, and stay motivated. Mistake #2: Building your business in a way that doesn’t take advantage of your strengths. I’m going to come right out and say it: you do not need to work one on one with clients, you do not need to have ads to your site, and you do not need to create a food blog in order to have a profitable virtual wellness business. Don’t get me wrong, I have made money coaching clients, I do currently have ad revenue as one stream of income, and Grass Fed Salsa is in fact a food blog. But here’s the thing… working with clients was emotionally and physically draining to me. Even if I’d had a 50 person waiting list for one-on-one coaching, I personally wouldn’t have been able to make a full time income with that as my focus since I couldn’t mentally take on enough clients to pay my bills. It’s actually very common for health coaches to find that they are unable to sustain a full service coaching practice for this exact reason! As for the ad revenue and food blog I mentioned, these are just 2 sources of revenue I have out of 9, and neither are my primary source of income. If you’re curious, I’ve listed below the different ways I currently see income on a monthly basis. There is not just one way create a profitable virtual wellness business. Let’s say you were to assume the best way to grow your business was to start blogging, sharing recipes, and working with one-on-one clients. But writing doesn’t come naturally to you, so each blog posts take hours to write. You don’t enjoy food photography, so you dread having to style and shoot your recipes. You find out you’re an empath, and tend to take on the struggles of your coaching clients, which leaves you drained and stressed. Even if your business was profitable, does it seem like you’d enjoy running it? Lesson learned: Everyone has different strengths and passions, so determining how to monetize your business in a way that compliments them is the best way to grow it with fluidity. Action step: Do some soul searching to identify your strengths and determine your true passion. Next week, check back in for some inspiration on how to make your business profitable when I share the second blog post in this series, 10 ways you can monetize your virtual wellness business. Mistake #3: Growing a tribe… but not fostering it. I worked hard to grow my email list – and I did it really well! I grew my list to over 7,500 subscribers through high quality opt in freebies (like free ebooks and a resource library)… and then I let that email list sit dormant for months until I’d finally get around to emailing my tribe. Similarly, I grew my Instagram account to over 10,000 followers, and my Facebook page and groups to over 2,000 followers, but then failed to share content with them consistently. Engagement dropped as it would have with or without the algorithm changes that we all love to hate. It seems to be a business epidemic to focus on growth, rather than focusing on true connection. I’m now at the point where I don’t care to continue a growth path. Instead, I’m focusing my attention on regaining the trust of those I worked so hard to attract. Lesson Learned: Don’t focus your time trying to reach the potential client/reader/friend you don’t have… spend time fostering a strong relationship with the ones you do. Action Step: Do you have a small email list or social media following? Instead of spending time on growth tactics (they are still important – but they aren’t everything! ), try reaching out personally to each person in your tribe. Find out who they are, and how you can connect and support one another. By fostering strong connections, you’ll create a tribe willing and eager to support you when you decide to monetize your business. Now, I’m sure you’re wondering… what gives me the authority to speak on creating a profitable virtual business? Full disclosure: while I was able to pay my business expenses and pay myself for the time I’d spend on Grass Fed Salsa for the first 3 years, my actual business wasn’t making any considerable amount of money. In fact, 2018 has been the first in four years that my business has been profitable. 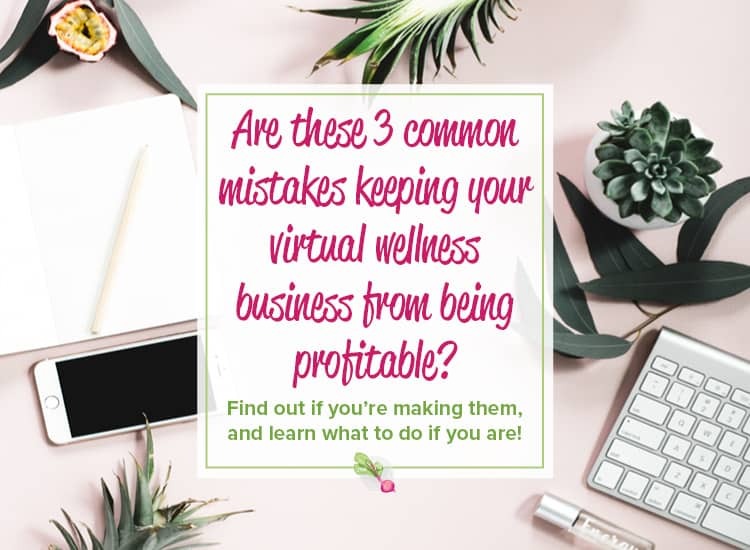 Yep, it took me 3 years to figure out how to make this virtual wellness biz profitable, but luckily for you, you don’t have to guess like I did. I’m sharing everything I learned in a new Virtual Business blog series. Over the next couple of months, I’ll be sharing what I do differently now to finally make a second income off my own virtual wellness business – while still working full time at my design job and taking care of my health and the health of my family. I won’t only share personal anecdotes in this series, I’ll share actionable tips on exactly what you can do to push your wellness business from “in the red”… to “breaking even”… to being a profitable virtual business. Start your online nutrition business with the help of my free Profitable Wellness Biz Boss Workbook, and start profiting from day 1! Do you have a wellness virtual biz or a desire to start one? Which article are you most excited to read? I’m Annika from Wholehearted Living & Wellness and I’m super excited to hear what you’ve learned over the past 4 years! Thank you so much for sharing your insights with those of us working on growing our own side gigs while still working full time. I’m curious to hear more about how you began learning to target your following more accurately once you realized you wanted to become more honest about how you follow AIP. So pump for this series! Hi Annika! Thanks for the comment 🙂 Can’t wait to share more on this business topic this year!